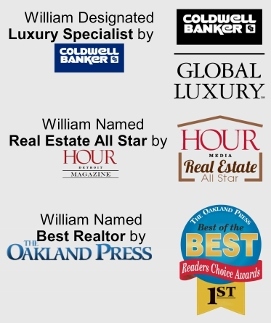 William Brundage has been named Real Estate All-Star by Hour Magazine, he has been named the Best Realtor by the Oakland Press, and he also honored to have been a Board Member for the March of Dimes. William is more than an industry leading Realtor who brings over twenty years of experience to successfully marketing and selling fine homes and estates. His dedication to his clients and our community places him in the top 1% of Realtors. Personalized service and client satisfaction are paramount. William is committed to getting you the best price and terms in the shortest amount of time. Click here to learn more about William..
An exclusive affiliation with Coldwell Banker Global Luxury gives William's listings unparalleled exposure both locally and internationally. Coldwell Banker Global Luxury's worldwide network showcases a collection of only the finest properties available worldwide. Only Coldwell Banker and William Brundage can provide this preferred level of service to their clients.